Audacious - Assists with Building Telepathic, Intuitive & Psychic Abilities; Fosters Open Communication; Empowers Healing, Clears & Aligns the Chakras; Encourage Meditation, Self-Expression, Manifestation, Assertiveness, Determination & Clarity. Deer Medicine -Antler – Deer medicine brings adaptability, flexibility, often indicates a new adventure. Deer are known for their innocence, gentleness and love; antler symbolizes a connection to Higher Wisdom. Stags are often used to symbolize the Goddess as well as the Heart. 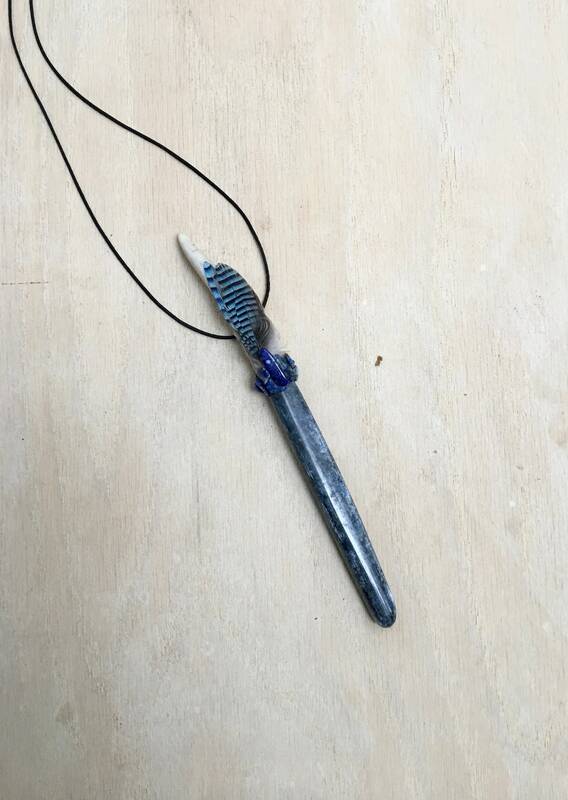 Blue Kyanite - The high vibration and rapid transfers of energy from Kyanite create pathways where none existed before. 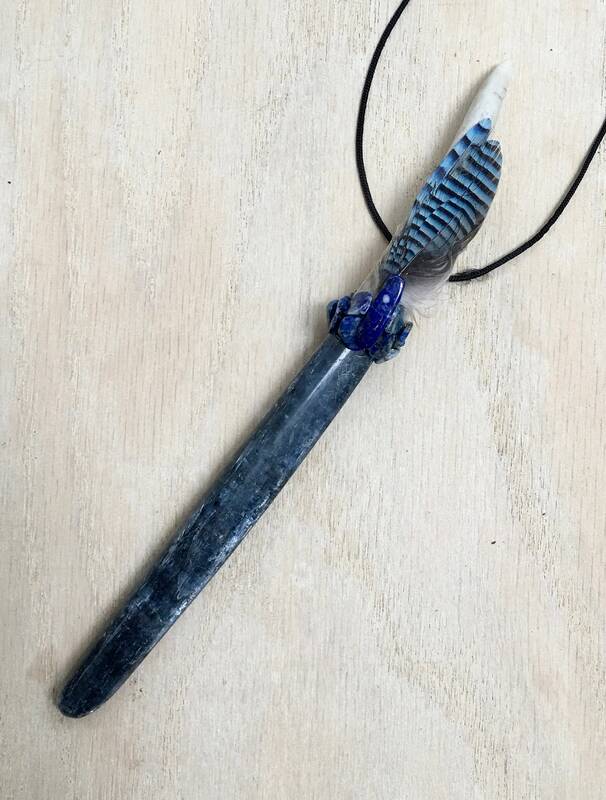 Like a universal bridge, it is an extraordinary crystal of connection, opening the mind centers, enhancing telepathic and psychic abilities, bridging gaps in all communication efforts, and providing a link for transmitting or receiving healing energy. It immediately aligns the chakras and subtle bodies, bringing tranquility and a calming effect to the whole being. It is an exceptional stone for transitioning into deep meditative states. 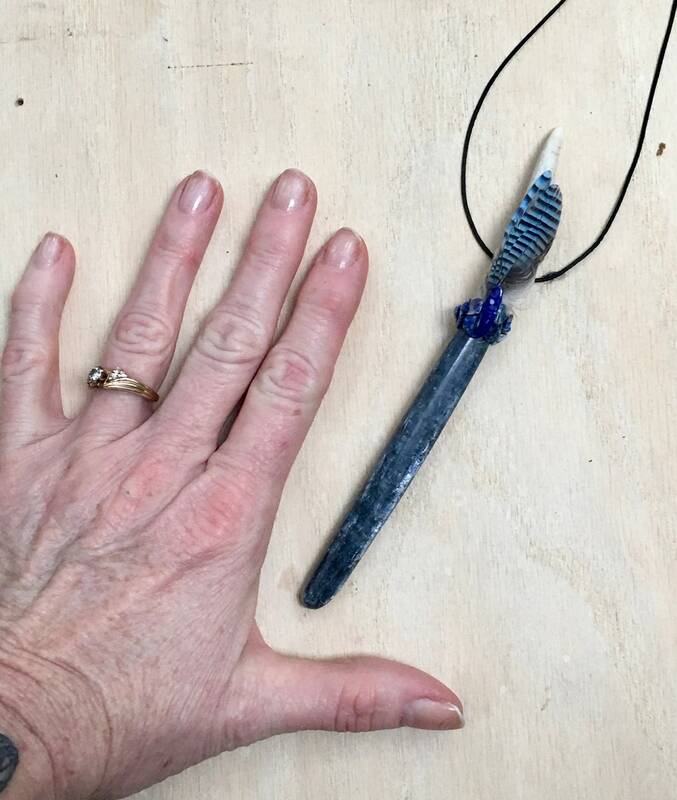 Kyanite promotes good communication, bridging the gap between different beliefs and ideas, and encourages self-expression and speaking one's truth. 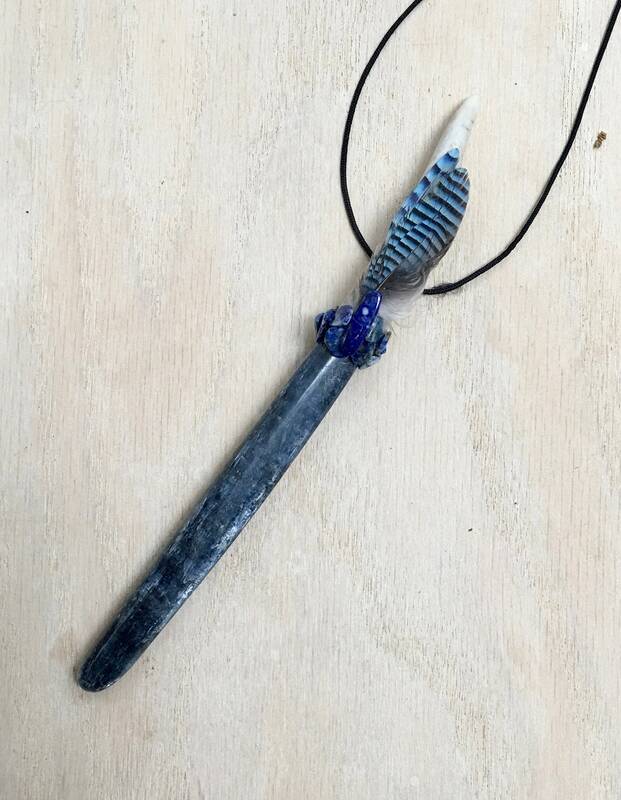 Lapis Lazuli - helps create and maintain a connection between the physical and celestial planes, creating a strong spiritual connection. Assists in contact with guardian spirits. Enhances intuitive and psychic awareness. Helps with writing. Is a manifestation stone. It is also an excellent meditation stone. 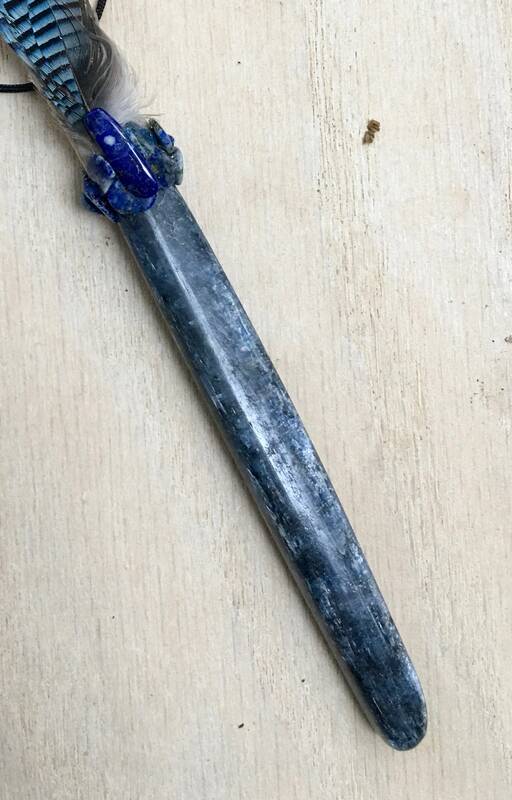 Lapis Lazuli is a stone of communication that can bring truthfulness, openness, and mental clarity. A protection stone. Eurasian Jay Medicine - Feathers - is a stern bird that is symbolic of royalty in the aviary community. They are symbolized by assertiveness, determination, and above all intelligence, as they are fiercely audacious when dealing with enemies. Symbolize clarity, vibrancy, allegiance, curiosity & self-love. Infused with the energies of Reiki & The Councils of Light. 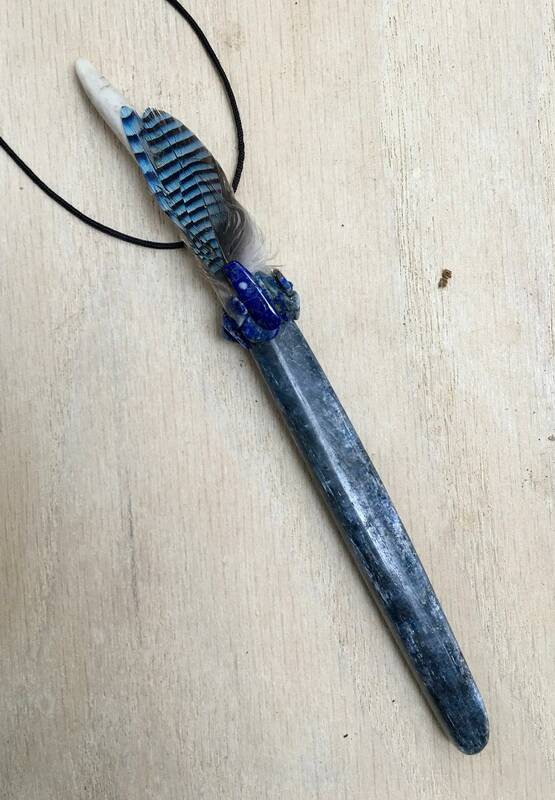 5.5 inches long; Blue Kyanite 4 inches. Comes on a adjustable chord. Comes with a card that describes all the properties of the wand, perfect for gift giving. We accept MC/Visa and Paypal. Shipping is through USPS priority mail. A tracking number will be emailed to you the next business day. Refunds will be issued within 30 days of purchase if the product is unharmed or changed. Wholesale pricing can be set up for those interested with a minimum purchase of $300.